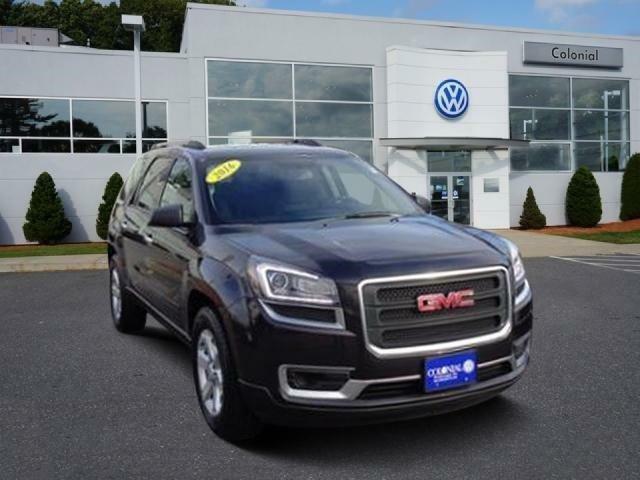 Highlights of this 2016 GMC Acadia SLE include: CARFAX 1-Owner, LOW MILES - 37,566! PRICE DROP FROM $23,665. Third Row Seat, All Wheel Drive, Rear Air, Onboard Communications System, Back-Up Camera, TRANSMISSION, 6-SPEED AUTOMATIC, ENGINE, 3.6L SIDI V6, Aluminum Wheels. AUDIO SYSTEM, COLOR TOUCH AM/FM/SIRIUSXM RADIO WITH CD PLAYER 6.5 diagonal touch-screen display, USB port and auxiliary input jack (STD), 6-SPEED AUTOMATIC (STD), 3.6L SIDI V6 (281 hp [210 kW] @ 6300 rpm, 266 lb-ft of torque @ 3400 rpm [359.1 N-m]) (STD). MY SKY POWER/REMOVABLE SUNROOF, 6.5 NAVIGATION GROUP W/UCONNECT SIRIUSXM Travel Link, (Registration Required), HD Radio, For Details Visit DriveUconnect.com, 6.5 Touchscreen Display, GPS Navigation, Uconnect Access, Remote USB Port, Radio: Uconnect 6.5 Nav, SIRIUSXM Traffic, SAFETY & SECURITY GROUP Tonneau Cover, Blind Spot & Cross Path Detection, Security Alarm, PASSIVE ENTRY KEYLESS-GO PACKAGE Passive Entry/KEYLESS-GO, TRANSMISSION: 9-SPEED 948TE AUTOMATIC (STD), ENGINE: 2.4L I4 MULTIAIR (STD). Highlights of this 2016 Lincoln MKZ Reserve All Wheel Drive With Navigation include: Excellent Condition, CARFAX 1-Owner. PRICE DROP FROM $24,222, PRICED TO MOVE $2,400 below NADA Retail! EPA 31 MPG Hwy/22 MPG City! Navigation, Heated Seats, Moonroof, Aluminum Wheels, Back-Up Camera, iPod/MP3 Input, All Wheel Drive, Turbo Charged, PANORAMIC ROOF, THX II. Highlights of this 2017 Honda HR-V EX include: Non-Smoker vehicle, WAS $20,991, PRICED TO MOVE $200 below NADA Retail! FUEL EFFICIENT 31 MPG Hwy/27 MPG City! Honda Certified, CARFAX 1-Owner, Very Nice, ONLY 29,330 Miles! Sunroof, Heated Seats, iPod/MP3 Input, Back-Up Camera, Alloy Wheels. Highlights of this 2013 Ford Explorer Sport include: Non-Smoker vehicle, New Tires & Brakes, GREAT MILES 66,600! WAS $20,995, PRICED TO MOVE $1,100 below NADA Retail! Moonroof, Nav System, Heated Leather Seats, Third Row Seat, 3.5L ECOBOOST V6 ENGINE, 4x4, Aluminum Wheels. 3.5L ECOBOOST V6 ENGINE (STD). CarAndDriver.com's review says The Explorer is no longer an old-school SUV, having switched to a slightly lighter unibody platform during its 2011 redesign.. Highlights of this 2017 Jeep Cherokee Latitude include: Serviced here, Non-Smoker vehicle, Originally bought here, CARFAX 1-Owner, Superb Condition, Jeep Certified. PRICE DROP FROM $20,999, EPA 27 MPG Hwy/20 MPG City! Moonroof, 4x4, Bluetooth, iPod/MP3 Input, Back-Up Camera, Aluminum Wheels, TRANSMISSION: 9-SPEED 948TE AUTOMATIC. COMFORT/CONVENIENCE GROUP Premium Air Filter, Power Liftgate, SIRIUSXM Satellite Radio, GPS Antenna Input, For More Info Call 800-643-2112, No Satellite Coverage, HI/AK, Passive Entry/KEYLESS-GO, Rear View Auto Dim Mirror w/Microphone, Universal Garage Door Opener, Air Conditioning ATC w/Dual Zone Control, Remote Start System, Power 4-Way Driver Lumbar Adjust, Remote Proximity Keyless Entry, Security Alarm, Power 8-Way Driver Seat, Humidity Sensor, POWER FRONT/FIXED REAR FULL SUNROOF, ENGINE: 3.2L V6 24V VVT W/ESS Pentastar, Stop-Start Multiple VSM System, 700 Amp Maintenance Free Battery, Dual Bright Exhaust Tips, TRANSMISSION: 9-SPEED 948TE AUTOMATIC 1 speed PTU (STD). Edmunds.com explains The Cherokee also features one of the better backseats in the compact crossover class. Not only does it recline, but it also provides for fore-and-aft adjustment, and the high-mounted bench supports adults' thighs without pushing their heads into the rafters..
VOICE-ACTIVATED TOUCHSCREEN NAVIGATION SYSTEM pinch-to-zoom capability, SiriusXM Traffic and Travel Link w/, Not available in AK/HI, SiriusXM audio and data services each require a subscription sold separately, or as a package, by SiriusXM Radio Inc, If you decide to continue service after your trial, the subscription plan you choose will automatically renew thereafter and you will be charged according to your chosen payment method at then-current rates, Fees and taxes apply, To cancel you must call SiriusXM at 1-866-635-2349, See SiriusXM Customer Agreement for complete terms at www.siriusxm.com, All fees and programming subject to change, SiriusXM and all related marks and logos are trademarks of SiriusXM Radio Inc, ENGINE: 2.0L ECOBOOST (STD), WHEELS: 18 MACHINE-FACE ALUMINUM magnetic-painted pockets (STD). Edmunds.com's review says The brakes on the Fusion inspire confidence, they're easy to modulate in traffic, and performance at the track was very consistent. In a simulated-panic stop from 60 mph, the Fusion (on all-season tires) needed only 116 feet, which is very good for the class.. Highlights of this 2018 Ford Fusion Titanium All Wheel Drive With Navigation include: CARFAX 1-Owner, Excellent Condition, ONLY 13,540 Miles! $1,800 below NADA Retail! FUEL EFFICIENT 29 MPG Hwy/20 MPG City! Nav System, Heated Leather Seats, All Wheel Drive, Back-Up Camera, WHEELS: 18 MACHINE-FACE ALUMINUM, ENGINE: 2.0L ECOBOOST, Aluminum Wheels. WHEELS: 18 MACHINE-FACE ALUMINUM magnetic-painted pockets (STD).